The financial functionality within the MIS enables you to produce the necessary invoices and credit notes required for your organisation. You can process items in a batch, consolidate orders onto a single document, support multiple currencies, multiple companies and give visibility to your whole team where appropriate. Tharstern enables you to take advantage of many of the accounting software packages available in the market, letting you choose the best one for your needs, by integrating directly to their ledgers (head here to find out more about our accounts integration add-ons). Provides user-definable sales analysis across departments or other profit centres with automatic posting to appropriate general ledger accounts for P&L analysis. Identify multiple financial divisions within your organisation and automatically post transactions to the ledgers of the relevant divisions. Separate document number ranges help manage traceability. Helps configure shared production facility across multiple divisions. 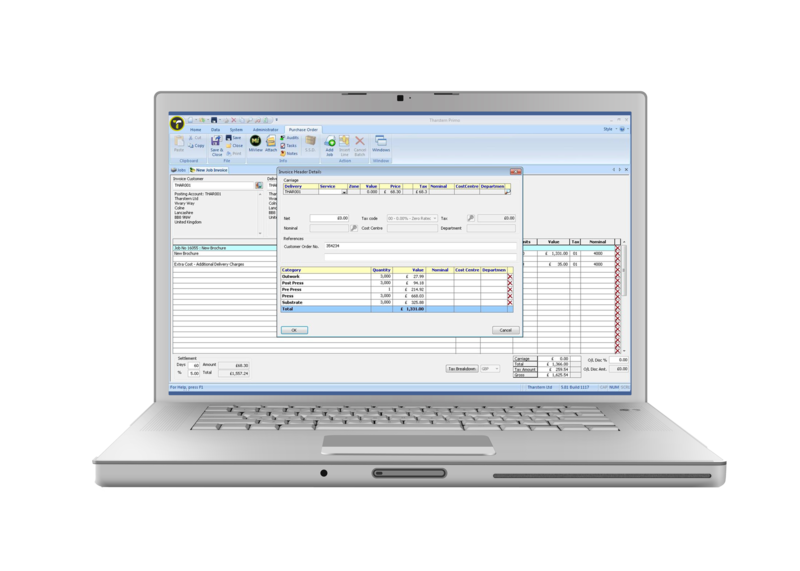 Powerful credit control integration to your accounting software. Checks credit limits against WIP and account balances and account on-hold status checking, to ensure jobs and quotes aren’t commenced in error (providing your chosen accounts software includes this functionality). We have established integrations to many of the leading accounts software packages. You can find out more in our integration section here.